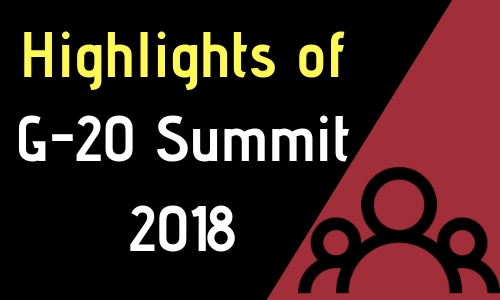 13th G20 summit was recently held in Argentinian capital Buenos Aires on 1st December 2018. India will host the annual G20 summit in 2022. Formed on 26 Sep 1999 to discuss policies related to financial stability. Expanded its agenda in 2008 including heads of governments/head of states as well as finance ministers and foreign ministers. Represent 85% of the global GDP, two third of the world population and 75% international trade. i.e. Japan, US and India. It was the first trilateral meeting between them. Ensuring stability, prosperity and security in the Indo-Pacific region bought them closer. Japan, India and USA are also engaged in quadrilateral security dialogue alongwith Australia. These three countries (JAI) also conduct joint military exercise named Exercise Malabar. In the last few years China has expanded its influence in Indo-Pacific as well as South China Sea region. China occupies and militarizes island in SCS which was another reason for these three countries (JAI) to come together. PM Modi presented a 9 point programme on ways to take action against fugitive economic offenders. i.e. Russia, India and China. They held the second trilateral summit the last was held in 2002. They called for reforming multilateral institutions like UN, WTO. They also agreed to have regular consultations to jointly promote international and regional peace and stability, to strengthen cooperation through BRICS. SCO and EAS.